Behind every successful startup is a founder who believes that his or her singular vision, along with dedication, hard work and solid execution, will turn an entrepreneurial dream into reality. But another valuable ingredient for startup success – tax incentive programs – can often be overlooked, especially by first-time founders who may lack the extensive investor and advisor networks cultivated by more experienced serial entrepreneurs. A range of federal, state and local tax incentives can help startups preserve cash for reinvestment in the business, or boost founders’ net gains in the event of an eventual sale. One of the major tax incentives available to startups is the Federal R&D tax credit under section 41 of the IRS Code. This credit is often overlooked by startups since, at one time, it could only be used once a business was profitable and paying income taxes. However, as part of the Protecting Americans from Tax Hikes (“PATH”) Act of 2015, the law was changed to allow eligible businesses to elect to apply their R&D tax credit against the company’s portion of social security tax liability. The R&D tax credit against payroll taxes is an important resource, as it can enable qualifying startups to free up funds to reinvest in growth or reduce expenses. Startup companies may apply up to $250,000 of their R&D tax credit per year against their social security tax liability as long as the company has gross receipts of $5 million or less and is within the first five years of generating revenue. Thus, it is advisable to start calculating the tax credit early on as this benefit changes over to the more traditional R&D tax credit against income taxes after the 5 year gross receipts period passes. Nearly every state in the US, as well as many localities, offer some form of tax incentive programs for startups. Incentives range from R&D tax credits comparable to the federal program, to cash incentives for employment growth, to exemptions from utility costs and property taxes. For example, California’s R&D tax credit is similar in some ways to the federal R&D tax credit and offers a benefit for qualified activities taking place within the state. New York State provides tax credits for Qualified Emerging Technology Companies (“QETCs”) including credits for job creation and a capital tax credit for investors in QETCs. The Grow New Jersey Assistance Tax Credit is available to businesses that create or retain jobs in New Jersey and make certain capital investments in facilities in a designated incentive area. Significantly, the credit is available to tenants that make leasehold improvements, as well as businesses that make investments in their own facilities. While many state and local incentive programs are targeted toward technology startups, founders should note that companies in many industries – including but not limited to transportation, defense, energy, logistics, life sciences, healthcare and finance – may qualify for tax breaks depending on the jurisdiction. The above examples, while not an exhaustive list, clearly show why it is beneficial for startup founders to learn as much as possible about the incentives available at the state and local level. Under the Qualified Small Business Stock (“QSBS”) provision in section 1202 of the IRS Code, investors who own QSBS may be able to eliminate tax on some or all of their gain from the disposition of their stock. Unlike some of the tax credits previously mentioned, the QSBS provision does not offset the startup’s tax liability in the near-term, but it may reward founders and others who make investments, and can be used as an employee incentive in certain cases. Many founders and entrepreneurs may be unaware of the benefits of QSBS, and thus are missing out on substantial tax savings. An investor who sells QSBS can exclude some or all federal income tax gains of up to $10 million, or 10 times their tax basis, whichever is greater (note that there may be some alternative minimum tax impact). Another key factor to keep in mind is that some states do conform to the exemption (such as New York State) increasing the overall tax benefit, while other states do not conform to the exemption (such as California and New Jersey). Among the requirements that determine whether or not a stock is considered to be QSBS, the issuer must be a C corporation with assets of $50 million or less immediately before and after the stock is issued. The corporation must be an active business, not a holding company. Companies in technology, manufacturing, retailing, and wholesaling are typically eligible for QSBS issuance, but other sectors such as personal services, most financial and investment firms, farms, mining companies, and hospitality businesses do not qualify. Also, QSBS must be originally issued stock acquired in exchange for money, property or as compensation for services provided to the corporation and must be held for more than 5 years. Investing in a startup is never easy. 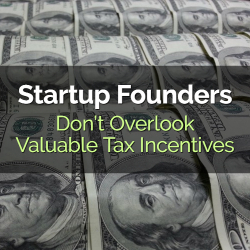 But founders should work with their tax and financial advisors to understand and take advantage of federal, state and local tax incentives that can make funding for their entrepreneurial dreams more readily available.